There are a million things to learn when you are involved in wedding planning. And of all of the wedding vendors that you need to search for, there is not one that is more challenging than finding a wedding invitation professional. You will have to learn about vocabulary that you may have never heard before in your life. 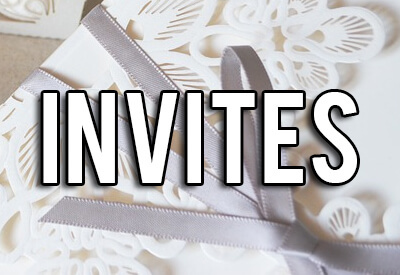 Words like letterpress, themography, engraved, matte, jacquard, glassine and more are the words of the day in the invitation world. It can be truly overwhelming learning the business of invitations so you need to take your search for a designer very seriously. There is nothing like a well designed wedding invitation to set the tone for your event. It is your calling card to the world. Lucky for you, the Atlanta area is not lacking in this area, there are hundreds of invitation professionals or designers out there vying for your business. Here are some questions to ask anyone and everyone that you are considering to be your invitation professional. Start by asking them about their experience. How long have they been in business? What is their design background? If they haven't graduated from a design school, don't automatically eliminate them from contention. There are some very talented people out there who are making a living designing that have never stepped foot inside a school of design. Pay attention to what they produce. How many wedding invitations have they designed? And speaking of designing, do they offer both custom designing and template designs? Do a lot of talking about your options in terms of paper, colors, fonts, ink, and word limits. Ask them where they do their printing. We recommend someone who outsources their printing only because it usually will cost you a lot less. Find out if you can get use them for all of your other printing needs. You will probably be wanting other printed items like place cards, programs, and thank you cards. And if you want all of these to have a consistent look, you will want to go with the same designer. And make sure you talk about assembling all of the pieces. This is very labor intensive so you will want to ask if they offer services like stuffing envelopes, tying ribbons and applying seals. Also, have a discussion about the addressing of the envelopes. Find out how much it would cost to have a calligrapher hand address all of your envelopes. There is a real debate here in the industry. Some people swear by this method, others say it is acceptable to have the envelopes printed on a printer. You will have to weigh the pros and cons and decide which option is best for you. Make sure you look at all of their packages, what is offered in each and how much each one is. There may be one that fits you perfectly and the price is within your budget. But whatever you do, make sure that you consider a number of candidates and that you compare each one side by side. Then you can at least say that you have made an educated choice. We wish you well with your search.